When it comes to movies about the Belgian cartoonist Peyo’s diminutive, liberty-cap-wearing, blue-skinned Schtroumpfs (or Smurfs, as well call them), being “good enough” means exceeding all expectations. Their first, Peyo-directed cinematic outing, released in this country as The Smurfs And The Magic Flute, is notable only for a song score that The Umbrellas Of Cherbourg’s Michel Legrand seemed to have composed in the midst of a mental breakdown; the decades-later attempts to turn the mushroom-dwelling humanoids into a Hollywood live-action franchise, in The Smurfs and The Smurfs 2, are simply dire. But now comes Smurfs: The Lost Village, an inoffensive children’s film with an above-average voice cast, competent animation, and no product placement. This is enough to make it the finest film ever made about the Smurfs. Fans of the recently rereleased Donnie Darko may recall that the Smurfs, though nominally male, are completely asexual, and that the blond-haired and womanly Smurfette (voiced this time around by Demi Lovato) is in fact a pseudo-Smurf who was created through dark magic by their arch nemesis, the balding and dim-witted wizard Gargamel (Rainn Wilson), but later switched sides. 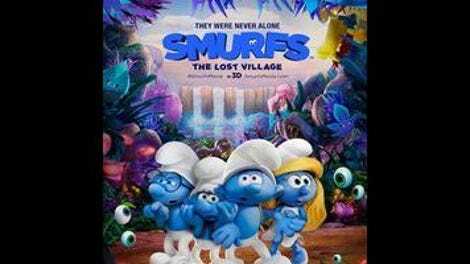 This is a plot point in Smurfs: The Lost Village, which finds Smurfette, Clumsy Smurf (Jack McBrayer), Brainy Smurf (Danny Pudi), and Hefty Smurf (Joe Manganiello) searching the far reaches of the magical forest for Smurfy Grove, a second, all-female community of Smurfs, with Gargamel and his cat, Azrael, in close pursuit. Along the way, our Smurf heroes befriend bioluminescent bunny rabbits, get chased by fire-breathing dragonflies, and do assorted wholesome Smurf-y things. Headed by the bearded, Santa Claus-ian patriarch Papa Smurf (Mandy Patinkin), the Smurfs are a community of almost identical little blue people where everyone has a job and a one-note personality. This makes them ripe for commentary, a fact that even their creator recognized. One of Peyo’s better-known comics storylines, later collected in Smurf Versus Smurf, had the community split over the proper usage of the word “smurf,” parodying the cultural divide between the Dutch- and French-speaking inhabitants of his native Belgium. There’s plenty to unpack, too, with the character of Smurfette, but Stacey Harman and Pamela Ribon’s screenplay prefers to keep it packed. Poking fun at Smurf naming conventions (Paranoid Smurf, Table-Eating Smurf, Karate Smurf, etc.) is about as clever as The Lost Village is willing to get. The story is boilerplate about boys learning to respect girls, complete with dialogue of the “I have a bad feeling about this!” variety, a vapid Meghan Trainor theme song, and pop culture references (Eiffel 65’s “Blue [Da Ba Dee],” extreme sports) that are now old enough to have children of their own. But mostly, it’s Smurfs being Smurfs. Director Kelly Asbury (Gnomeo & Juliet) even pulls out a handful of semi-inspired visual ideas, most notably in a sequence that finds the four Smurf adventurers trapped in different parts of an underground tunnel. Quickly paced, cutesy, and lightweight, it’s a film that no one except the most Smurf-pun-averse will mind having to sit through. Unfortunately, that’s the most distinctive thing about it.